Cactus Hotel has a lobby with a cafeteria and a small bar that works 24 hours serving coffees and alcoholic drinks. The swimming pool area is served by a large 20 stool bar offering coffees, drinks and snacks througout the day until 22:00pm. The main restaurant seats 80 guests and its open for breakfast, lunch and dinner. Guests can also enjoy all their meals at the spacious pool terrace restaurant which can seat up to 100 guests. The hotel has a spacious pool area with a 6 x 15 meter overflow style swimming pool. Sunbeds and umbrellas can be used free of charge by hotel guests. A small corner of the games room is dedicated to our little guests, with toys, an arts and drawing table and a playhouse. A small cafeteria in the same area, allows parents to enjoy their coffees and drinks whilst watching their children play safely. The hotel offers a private area for group meetings and business conferences. It fits up to 50 people with comfortable sitting, individually controlled air conditioning and black out curtains. A very big TV screen is available on request, as well as a projector. For organized meetings, coffee breaks can be organized. This area is also suitable for private parties for groups of up to 50 people. 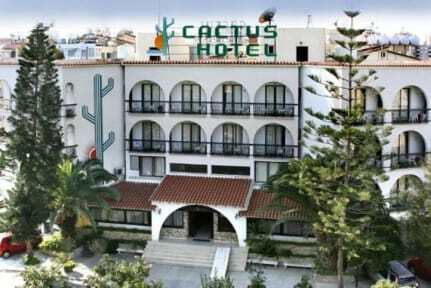 Cactus Hotel is located in the area of Makenzie in Larnaka. It is ideally situated a street behind the seashore, so it is protected from the loud noises of the busy road and the loud music of the surrounding bars and restaurants, yet it’s still just a 3-minute stroll from the beach. With a total of 60, Double/Twin Rooms are perfectly suited for couples, families with young children and for single occupancy. These rooms can easily accommodate a cot or extra bed.